Five persons, including three children, are confirmed dead, and at least 15 are missing and presumed dead after a small boat (known locally as a “kwassa-kwassa”) sank off of the French island of Mayotte on 19 May. 19 people were rescued. The boat sank after striking a coral reef. The boat was attempting a 100 km voyage from the island of Anjouan in the Union of the Comoros to the French island of Mayotte. 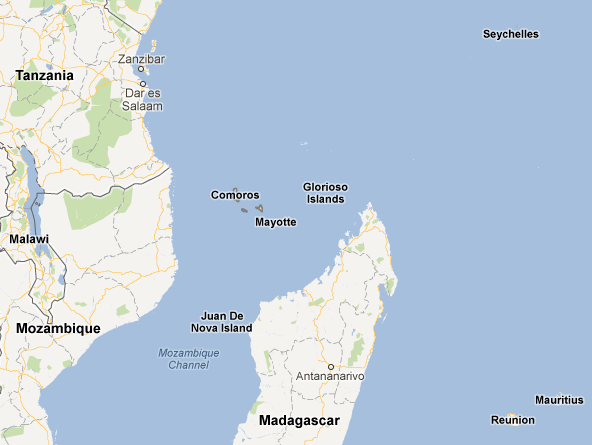 Approximately 200 people each year are believed to die attempting to make the 100 km voyage from the Comoros to Mayotte. Click here (EN), here (FR), here (FR), here (FR) and here (FR) for articles. FIDH, GISTI, and Migreurop are holding a press conference at 11:00 AM on Wednesday, 11 April, to announce the filing of a legal complaint against the French military with the Procureur de la République du Tribunal de grande instance de Paris alleging that military forces failed to render assistance to the migrant boat that drifted for days one year ago within the NATO military zone off the Libyan coast. 63 persons ultimately died. Un an après la mort de 63 migrants dans un bateau au large de la Libye, des survivants, avec le soutien d’une coalition d’ONG déposeront, mercredi 11 avril, devant le auprès du Procureur de la République du Tribunal de grande instance de Paris , une plainte mettant en cause l’armée française pour non assistance à personne en danger. Cette conférence de presse sera l’occasion de revenir en détails sur les événements de ce périple cauchemardesque et d’expliquer pourquoi notre coalition estime que certains militaires français devraient en l’espèce voir leur responsabilité pénale engagée. Real Instituto Elcano has published an analysis regarding the situation in North Africa and its impact on irregular immigration to the EU. The analysis was written by Frontex’s Deputy Executive Director Gil Arias. “… En el caso de que el régimen de Gadafi recupere el control, la UE y sus Estados Miembros no podrán reanudar la cooperación con un régimen totalmente desacreditado. Se producirá el cese en la aplicación de acuerdos de cooperación policial que en el pasado (desde mayo de 2009) sirvieron para detener los flujos de inmigración irregular desde Libia hacia Italia y Malta. La posibilidad de que ciudadanos de otros países africanos bloqueados en Libia sean obligados o “ayudados” a emigrar a la UE no debe descartarse. De hecho, Gadafi ha amenazado con “abrir la puerta” de la inmigración ilegal hacia Europa. La OIM estima la cifra de extranjeros presentes en Libia entre 0,5 y 1,5 millones. No obstante, no todos serian candidatos a la inmigración ilegal. Se trata fundamentalmente de trabajadores empleados por empresas extranjeras asentadas en el país, por lo que su intención primaria no sería la emigración a la UE y por otra parte una buena parte de ellos ya han abandonado Libia. En el peor de los casos, la consecuencia de ese “abrir la puerta” sería la reactivación de los flujos por vía marítima hacia Lampedusa y Malta (eventualmente también Creta, que se encuentra a 200 km de distancia de la costa libia) en un escenario similar al de 2008 (40.000 inmigrantes llegaron a Italia y Malta, con origen en las costas libias) agravado por el efecto adicional de la inestabilidad en el país. Su destino principal serían los países con presencia importante de ciudadanos norteafricanos (Italia, Francia, España, Bélgica y el Reino Unido). El destino de los nacionales de países subsaharianos se encontraría más repartido por toda la UE. Si Gadafi es derrocado resultará clave la capacidad y rapidez de la oposición para reorganizarse. La oposición se encuentra, por el momento, bastante desorganizada y es probable que se produzcan luchas internas por el poder, especialmente por el control de los campos petrolíferos. Ello podría conducir a un estado persistente de disturbios y a una ausencia de control por un largo periodo de tiempo. La eventual reactivación de las rutas migratorias hacia la UE dependerá de la capacidad del nuevo régimen para imponer la ley y el orden en el país así como el control efectivo sobre los 2.000 km de costas y 4.000 km de fronteras terrestres libias. En el peor de los escenarios podría darse una situación similar a la de Somalia. En este escenario, la economía libia puede deteriorarse y elevarse los niveles de desempleo. Actualmente se desconoce la tasa de desempleo en Libia, pero se presume baja. Previsiblemente, la mayoría de los trabajadores desempleados intentará regresar a sus países, pero parte de ellos (sobre todo los nacionales de países inseguros) buscaran otras oportunidades, entre ellas la emigración clandestina a la UE. La ausencia de ley y orden, especialmente la ausencia de control sobre las fronteras marítimas, llevará rápidamente a las mafias al tráfico de inmigrantes hacia la UE. Los candidatos serían primariamente trabajadores desempleados no deseosos de volver a sus países (mayormente de África Occidental y Oriental, pero eventualmente también libios, egipcios, argelinos y tunecinos). Esta situación impediría, por otra parte, el retorno de quienes fuesen detectados cruzando ilegalmente las fronteras exteriores de la UE. En tales circunstancias se puede prever un flujo constante de inmigración ilegal durante meses, mayoritariamente por vía marítima, pero también por vía aérea a través de Turquía. La duración en el tiempo de este escenario dependerá de la rapidez con la que la UE o los Estados Miembros y las nuevas autoridades sean capaces de restablecer la cooperación. En este sentido, serán determinantes los acuerdos de readmisión efectivos. “…In the case of Qaddafi’s regime regaining control, the EU and its Member States shall not resume cooperation with a discredited regime. Termination will occur in the implementation of agreements on police cooperation in the past (May 2009) served to stop the flow of illegal immigration from Libya to Italy and Malta. The possibility for citizens from other African countries locked in Libya are forced or “helped” to migrate to the EU can not be ruled out. In fact, Gaddafi has threatened to “open the door” of illegal immigration into Europe. The IOM estimates the number of foreigners in Libya between 0.5 and 1.5 million. However, not all candidates would be illegal immigration. These are mainly employed by foreign companies settled in the country, so that their primary intention would not be the migration to the EU and, moreover, a good portion of them have already left Libya. In the worst case, the consequence of this “open door” would be the reactivation of the flows by sea to Lampedusa and Malta (and possibly Crete, which is 200 km away from the Libyan coast) in a scenario similar to that of 2008 (40.000 immigrants arrived in Italy and Malta, departing from the Libyan coast) aggravated by the additional effect of instability in the country. Its main destination countries would be a significant presence of North African citizens (Italy, France, Spain, Belgium and the UK). The fate of the national sub-Saharan countries would be more distributed throughout the EU. If Gadhafi is overthrown will be key capacity and speed of the opposition to regroup. The opposition is, at present, quite disorganized and is likely to produce internal power struggles, especially for control of the oilfields. This could lead to a persistent state of unrest and a lack of control over a long period of time. The eventual recovery of migratory routes towards the EU depends on the ability of the new regime to impose law and order in the country as well as effective control over the 2,000 km of coastline and 4,000 km of land borders Libya. In the worst case scenario could be a situation similar to Somalia. In this scenario, the Libyan economy may deteriorate and unemployment levels rise. Currently unknown unemployment rate in Libya, but presumably low. Predictably, most unemployed workers try to return to their countries, but some of them (especially insecure country nationals) to seek other opportunities, including illegal migration to the EU. The absence of law and order, especially the lack of control over maritime borders, whisk the trafficking mafias immigrants into the EU. Candidates would be primarily unemployed workers eager to return to their countries (mostly from West and East Africa, but also possibly Libyans, Egyptians, Algerians and Tunisians). This would prevent, on the other hand, the return of those who were detected illegally crossing the external borders of the EU. In such circumstances, can provide a steady flow of illegal immigration for months, mostly by sea, but also by air through Turkey. The long life of this scenario depends on the speed with which the EU or the Member States and the new authorities are able to restore cooperation. In this regard, will determine the effective readmission agreements. The Guardian on Sunday reported many more details about an incident that began on 25 March when a migrant boat left Libya carrying 72 asylum seekers and which ended 16 days later on 10 April when the disabled vessel washed ashore in Libya with only 11 survivors. The survivors have described several incidents where military ships and planes ignored their pleas for rescue. It is clear from the survivors’ descriptions that their disabled vessel was sighted because at one point a military helicopter dropped bottles of water and emergency food rations on the migrant boat. The UNHCR and Father Mussie Zerai, an Eritrean priest in Rome who runs the refugee rights organisation Habeshia, have called for further investigations into why the boat’s passengers were not rescued. From the Guardian article: “The Guardian’s investigation into the case of the boat of 72 migrants which set sail from Tripoli on 25 March established that it carried 47 Ethiopians, seven Nigerians, seven Eritreans, six Ghanaians and five Sudanese migrants. Twenty were women and two were small children, one of whom was just one year old. The boat’s Ghanaian captain was aiming for the Italian island of Lampedusa, 180 miles north-west of the Libyan capital, but after 18 hours at sea the small vessel began running into trouble and losing fuel. Using witness testimony from survivors and other individuals who were in contact with the passengers during its doomed voyage, the Guardian has pieced together what happened next. The account paints a harrowing picture of a group of desperate migrants condemned to death by a combination of bad luck, bureaucracy and the apparent indifference of European military forces who had the opportunity to attempt a rescue…. The Guardian has made extensive inquiries to ascertain the identity of the Nato aircraft carrier, and has concluded that it is likely to have been the French ship Charles de Gaulle, which was operating in the Mediterranean on those dates. French naval authorities initially denied the carrier was in the region at that time. After being shown news reports which indicated this was untrue, a spokesperson declined to comment. Click here for full Guardian article. Click here (IT) for earlier article. The French naval vessel the Courbet stopped several Libyan patrol boats on 29 April that were in the process of attempting to lay mines outside the Misrata harbour. Three mines were discovered in the waters. This is a new danger for civilian ships and boats in Libyan waters. (HT to Bruxelles2). Click here (FR) for French Ministry of Defence statement. “It’s important to prepare for what’s happening in Northern Africa and to have a long term strategy for the cooperation with our neighbouring countries. There’s however quite worrying tendencies in Member States to be too event-driven and calling for quick-fix measures. It’s important to remember that out of the approx. 25.000 migrants coming to the EU the last couple of months only a few thousands are refugees, seeking asylum in the EU. The others are economical migrants from Tunisia looking for work and a better life in Europe. These people are likely to be sent back to Tunisia. The few thousand refugees that have been coming the last months should also be seen in the right perspective – last year France alone received 48.000 asylum seekers and Sweden 32.000 – the total number of refugees coming to the EU last year was 236.000. On a slightly related point, the link between anti-immigrant views and increasing support for some political parties such the Front National and Marine Le Pen in France and the Northern League in Italy are well know. In Finland a populist party, the True Finns, has for the first time entered Government after its stunning third place finish in the 17 April parliamentary elections. Many have described the True Finns as populist party that is most interested in the Euro crisis and the financial bailouts. But recent public comments of new True Finn MP Teuvo Hakkarainen reveal the anti-immigrant and racist sentiments held by some party members. According to YLE, Hakkarainen said that “Negros” would be arriving at Finland’s borders and warned that minarets would arise all over Helsinki. Some credit is due to True Finns Party chair Timo Soini who has reprimanded Hakkarainen for his comments. The new Government has just been formed and the True Finns will chair the parliamentary committees responsible for Foreign Affairs, Defence, and the Administration Committee which has responsibility for immigration issues. Over 1000 people demonstrated in front of the Parliament building earlier in the week in support of tolerance and multiculturalism. Click here (EN) and here (SV) for blog post. Click here and here for YLE articles. We got a small taste of the populist forces at work with yesterday’s results in Finland’s parliamentary elections and the strong third place showing of the True Finns led by Timo Soini. While the True Finns are currently focused more on blocking the Portuguese financial bailout, anti-immigrant sentiments within the party are strong. Click here (FR), here (EN), and here (EN) for articles. French Prime Minister Francois Fillon, after meeting yesterday with EC President Jose Manuel Barroso, said that it does not make sense to intercept Tunisian migrants at sea and then bring them to Lampedusa; it would make better sense if the Frontex mission based in Italy intercepted Tunisian migrant boats at sea and returned them directly to Tunisia. Fillon said: “There is no rule that provides for the reception and free movement on European territory of illegal economic migrants. A large portion of the Tunisian migrants who have arrived in Italy, are not destined, as some suggest, to be resettled in different European countries, they are destined to return to their country.” («Il n’y a aucune règle qui prévoit l’accueil sur le territoire européen et la libre circulation des immigrants économiques clandestins. Une grande partie des ressortissants tunisiens qui sont arrivés en Italie, n’ont pas vocation, comme certains le proposent, à être répartis dans les différents pays européens, ils ont vocation à retourner dans leur pays.») Italian Foreign Minister Franco Frattini praised Fillon’s proposal.